We've looked at lots of different ways to make bows so far, from pew bows, chair back bows to arch bows, but the big poofy wedding bow is the most versatile of all. 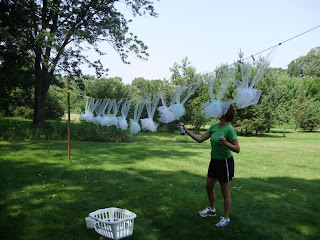 Learn how to make this beauty and you'll save loads of money of your wedding budget. What's The Best Material To Use for Bows? It largely depends on what areas you are decorating with your big poofy wedding bows as to the best material to use, but overall the best results will be gained from using quality stiff ribbon or fabric, or wired ribbon (ribbon that has thin wire running down each edge). 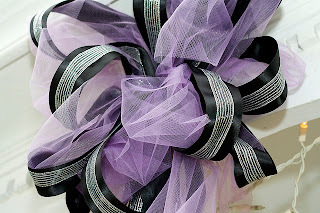 The idea behind using a stiffer fabric, or ribbon with wire edging, is that the bows will be more likely to stay put, and will definitely retain that "poofy" look that we are striving for. 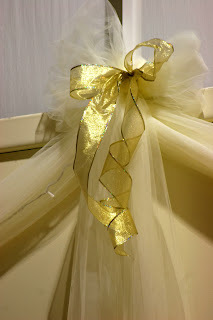 A more relaxed and soft bow will be created by using softer fabrics, and using this kind of ribbon is fine if you are making small poofy bows, or bows to decorate chair backs for weddings. If you find the perfect fabric but it's not a ribbon, you can cut strips of it to your chosen width and length, making a small allowance for hemming or zig-zag stitching the edges, so they don't fray. For a poofy bow suitable for a larger surface like an arch or tree, the ideal width of your ribbon or fabric strip should be at least 6 inches, and the length for each piece should be about 2 yards - this is obviously flexible depending on how full you want the bow to look. It is worth taking some time with the first bow before cutting up a large supply of ribbons of the same length, as you can then adjust the dimensions accordingly. Start by securely holding your length of ribbon in your left hand hand, in the middle (fold in half to find the mid point accurately). With your right hand make a loop to one side of the center, and hold it in place at the center, with your left hand. Make a small ring shape (as opposed to a large loop) with one side of the ribbon - make it big enough to thread your ribbon through later on. 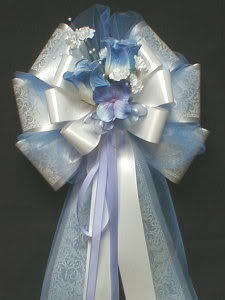 Take a second piece of ribbon, either the same length, or a half length. Holding all your loops together with the left hand, pass the second piece of ribbon through the ring shape you made (like threading a needle). When you have threaded half your ribbon through this small loop, take both ends and wrap them around the middle. Finish by tying a knot with this second piece at the back of the bow. The ends can hang down to join the other loop ends in making the tails of the bow. If you find it difficult to hold so many loops in your hand while making the loops with the other, try using a bulldog clip or hat pin to hold the loops in place, as you use both hands to make the loops. If you've found the perfect design fabric for your wedding but it isn't stiff enough to use for poofy bows, try using spray starch once you've completed your bows to stiffen up the fabric and keep it in place. To make the loops look more full on big bows, try using strips of plastic made into rings or loops, and pushed underneath the top layer of the loopy end of the loops, pushing them out and making them look more full. Use a small blob of white glue underneath, or a dressmakers pin to secure. You can reuse plastic packaging, such as yoghurt pots, etc., to make your strips. Whether you are decorating your home for a wedding, a church, or decorating outdoors, knowing how to make big poofy wedding bows will ensure you have a spectacular looking bow that will stay put throughout the day.